What Is FitLife Total Face CPAP Mask? Who Should Buy FitLife Total Face CPAP Mask? CPAP masks belong to the category of Class II Medical Devices. As such, they require a medical prescription. Before purchasing a CPAP mask, please consult with your doctor or medical provider. If you have ever struggled with a sleeping disorder, you know what the value of a quality night’s rest actually is. For people with obstructive sleep apnea, rest can be hard to come by. Sleep apnea manifests itself in a variety of different ways and the vast majority of them end up leaving you more and more fatigued. Fortunately, researchers have managed to create devices known as CPAP machines in order to help treat the sleep disorder. CPAP machines – and CPAP masks by connection – work to help you breathe more easily during the night while you sleep. There are many different CPAP masks available for sale on the Internet, but we will now focus on one of the best ones around – FitLife Total Face CPAP Mask. 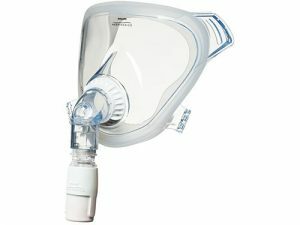 Keep reading our FitLife Total Face CPAP Mask review to learn all there is about this CPAP mask. Developed by the manufactures at Philips, FitLife Total Face CPAP Mask aims to be the solution to your problems with sleep apnea. This is a full face mask that covers you from your hairline down to the bottom of your chin. Touted for a variety of different reasons, FitLife Total Face CPAP Mask looks like it can be a game-changer in the mission to treat sleep apnea. Let’s take a moment to talk about how sleep apnea impacts you while you sleep before delving into the meat of our FitLife Total Face CPAP Mask review. With obstructive sleep apnea, you may experience chronic fatigue, snoring, and even bouts where you don’t breathe. These symptoms occur when you have airflow problems in your throat. These scary symptoms can be managed by wearing a CPAP mask to bed. 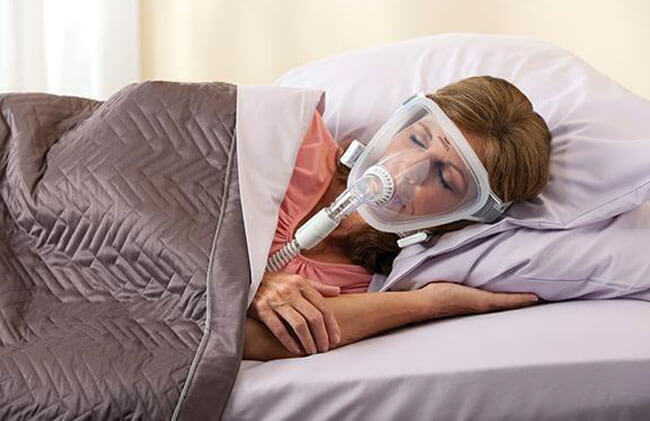 With FitLife Total Face CPAP Mask, you are wearing a total face mask that works to bring continuous air pressure to your throat so as to prevent the collapsing of the muscles therein. FitLife Total Face CPAP Mask is a full face mask that is suggested for people who struggle getting comfortable with other mask options available on the market. As you can see from the picture, this mask covers your entire face, including your eyes. FitLife Total Face CPAP Mask is hooked up to your CPAP machine by a hose, as is tradition to the product, and you wear it while you sleep. It is as simple as it gets! One of the most important aspects of using a product like FitLife Total Face CPAP Mask is making sure that it is correctly sized. Some CPAP masks come in a variety of different sizes while others make you go through a fitting process. With FitLife Total Face CPAP Mask, you have to go through both a fitting and a sizing session before you can wear the mask. To size your mask, you will need to use the plastic sizing gauge that comes with your packaging materials. How do you do this? Keep on reading. Take the plastic gauge and hold it against your face, lining up your eyebrows and chin. Match the proper cushion size to this size, paying attention to your mouth and sight. When fitted correctly, the top of your cushion should rest against your forehead, above the eyebrows. The bottom cushion should rest just under your mouth, slightly above your chin. Once you’ve got your mask properly sized, you can go on with actually wearing the product. Use the headgear straps in order to size the mask to your face. You want a proper seal, but you do not want the mask to be too tight. Our FitLife Total Face CPAP Mask review is largely focused on the quality and design of the mask, but we should spend some time talking about proper maintenance. As with anything you use on a nightly basis, hygiene and cleanliness are of vital importance. Get into the habit of washing your mask on a nightly basis with warm water and a mild soap. Make sure to let the mask air-dry before use. Pay close attention to the mask during cleaning in order to monitor for discoloration or cracks. Replace any parts that begin to show signs of deterioration. While you can make an argument that the majority of full face CPAP masks are similar to one another, FitLife Total Face CPAP Mask is different from the competition in many ways – and especially in regards to its target audience. Wearing a CPAP mask can be an uncomfortable situation for many people and FitLife Total Face CPAP Mask is created for those individuals who struggle with this type of treatment. Here’s who should consider buying a FitLife Total Face CPAP Mask. Claustrophobic Users – If traditional full face masks make you claustrophobic, FitLife Total Face CPAP Mask is a great alternative. Mouth Breathers – If you breathe through your mouth or otherwise struggle to breathe through your nose, this mask is right for you. Back Sleepers – Total face masks are ideal for people who sleep on their backs. Essentially, if you suffer from sleep apnea and want to address it with a comfortable CPAP mask, FitLife Total Face CPAP Mask may be the solution you need. Customers have been universally glowing about their FitLife Total Face masks, but that doesn’t mean that the product is perfect. Let’s see what users think of the product. Compliments – The tight seal, which wraps around the outer edge of your face, won rave reviews from customers who hated the bulkier full face options on the market. Customers additionally liked the fact that there were almost no leaks in the product. The fitting guide scored high marks for being easy to do and the flexibility of the fitting process also won praise. Complaints – The biggest complaint about the mask was the fact that you cannot sleep on your side while wearing the device. Additionally, some users complained of mild pain where the mask touched their face – likely due to sizing errors. 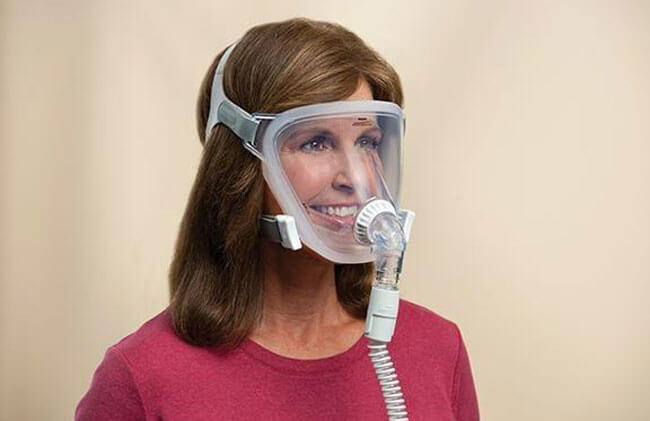 FitLife Total Face CPAP Mask is available for $165.00. CPAP masks are hard products to return or get a refund for due to the nature of their usage. Once opened, you cannot reasonably return the product to new condition because of the likelihood that it has been used. As such, Philips accepts returns on unopened products that still possess their original packaging. If you are still unsure if FitLife Total Face CPAP Mask is right for you, check out the key advantages and flaws of this snoring aid. With FitLife Total Face CPAP Mask, you are getting a product that is an effective and innovative twist on a relatively unexciting industry. The full face design, with no nose or mirror attachment, makes for a comfortable experience that still allows you your freedom of movement and comfort while awake. Our ratings are the result of an objective and independent evaluation of FitLife Total Face CPAP Mask, generating the final rating that reflects the overall quality of the company. Ratings may change as the product introduces changes. FitLife Total Face CPAP Mask user rating based on 5 user reviews. The mask felt great for the first couple of nights and I could even sleep on my side with some minor adjusting. However, last night, one of the headgear clips broke and the mask fell off. I don't know how this happened but I know I had to dish out another 15 bucks for a two-pack replacement. I used the mask last night for the very first time and it's much better than the one I previously used. However, I'm still not quite sold on the way it fits. It doesn't leak air at the moment but it just doesn't fit properly on my head. The headgear is adjustable, but that doesn't seem to help much. So, it works, which is the most important thing, and I hope I'll get used to the feeling of wearing it with time. The only bad thing about this mask is the low quality of the well crow areas on the headgear. After a while, it starts rolling at the edges and becomes looser, which results in poor fit and leaking air. So, you pretty much have to replace the entire headgear once the adjustable tabs stop grabbing properly. The mask worked fine until I had to replace the headgear. I've bought the replacement in the same size but it constantly leaks air ever since I changed the old straps. The headgear didn't have the Respironics logo, though, but it was sold as an original replacement. FitLife facemask is very well designed and made of pretty comfortable material. The straps on the headgear are wider than some others I've used in the past so they allow me to make various adjustments and get Velcro in place without any problems. Also, the width of the straps helps distribute the pressure more evenly, which is greatly appreciated by my head. I've also noticed that wider straps leave last marks on my face every morning. We found 0 verified FitLife Total Face CPAP Mask discounts for April, 2019. There are no FitLife Total Face CPAP Mask coupons or discounts right now.